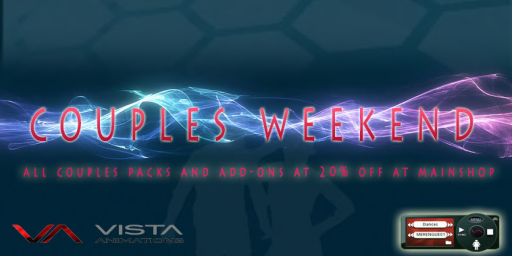 There is 20% off all couples packs and Add – On’s at the Vista Animations main store this weekend. This is an amazing opportunity to buy different dances, HUD’s and animations for loved up couples in Second Life. Made using Mocap technology in the Vista Animations studios in Barcelona in RL, these are the most realistic animations in SL.